happy weekend, friends! just popping in quick to share this delicious salad with you. i’m mindful that it may still be cold, even snowy, where you are, which is why i’m sharing a warm salad with you. this deconstructed falafel salad, (aka, a genius recipe, if you ask me), comes from the new spring cookbook that i absolutely adore, FAMILY. it’s written by hetty mckinnon who also authors the beautiful blog, arthur street kitchen. this is hetty’s third book (! ), and its’ pages are filled with beautifully accessible and approachable vegetarian recipes. its touching photographs and anecdotes of family and tradition pull at my heart strings each time i open the book. i think for the majority of us who enjoy cooking our your people - whoever that may be - is a form of nurturing them. FAMILY captures this notion, but also allows the reader/consumer to imagine making their own memories with the recipes that hetty so generously shares. i’m taking serious note of hetty’s wealth of knowledge here, as she’s a mother of 3, and a cook.. i’m very well acquainted with how cooking for your family (after a day of cooking for work) can feel very much like a chore, but i keep drawing on hetty’s idea of creating a recipe repertoire - the dishes that are comforting, easy to shop for without a list, and adaptable. there are already so many dishes in her book that i am so eager to make into our family classics. this recipe has a few more steps but only because you’re cooking the chickpeas, and lightly sautéing the kale, other than that there are a few quick chops and you’re ready to serve. this is a hearty salad on its own. if you’re not one to have a big appetite for dinner this would be great. i added some shredded chicken for extra protein, but you i could see this salad as is being plenty for someone who isn’t growing a human ;) so what’s deconstructed about this falafel salad? well, for starters, there is no falafel! don’t get me wrong, i love falafel, but making them can be a little labor intensive, especially if you’re preparing dinner the night of. 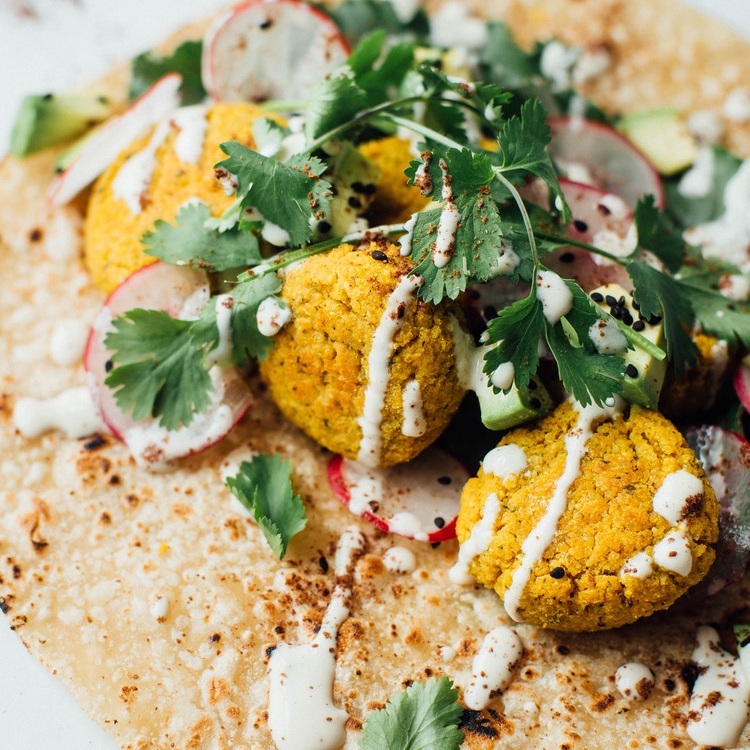 instead, hetty has you cook the chickpeas (which are the cornerstone ingredient to most falafel recipes) with all the falafel seasonings: fresh garlic, cumin, paprika, salt, and pepper. then you cover it all in olive oil and bake it at a high heat, essentially slow frying the chickpeas (insert: drooling emoji). the result is genius: crispy (but not dry) chickpeas, and a falafel-infused oil that is so flavorful i wanted to pour it over everything. for the crispy chickpeas, place the drained chickpeas in a small ovenproof dish. cover with olive oil, season well with two big pinches of sea salt and black pepper, and add the garlic, cumin, and paprika. stir to combine. roast for 35-40 minutes, until the chickpeas are crispy. set aside. for the salad, place a large frying pan over a medium heat and drizzle with oil. add the kale, in batches, along with a pinch of salt and cook 2-3 minutes, until wilted. to make the lemon tahini, pour the tahini into small bowl and whisk in the lemon juice and garlic. gradually add 1 tablespoon of water at a time, until the sauce is the consistency of thickened cream. if the tahini “seizes” and becomes very thick, add more water; it will eventually come back together to form a cohesive creamy sauce. season with sea salt and black pepper, and add more lemon juice if you like it lemony. combine the crispy chickpeas (and their cooking oil) with the kale, cucumber, half the pita chips and herbs. to serve, drizzle over the lemon tahini and scatter over the remaining pita chips. serve with lemon wedges on the side.